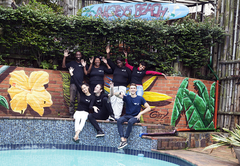 Ansteys Beach Backpackers is a providing accommodation in Bluff in 57 guest rooms for tourists visiting the Durban region. 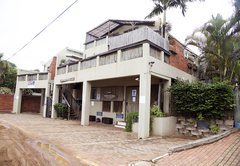 Come and experience laid back and comfortable beach living at its best at Ansteys Beach Self Catering Apartments on the beach. We pride ourselves on making our guests feel comfortable and welcome, which is why many happy guests return time and time again. 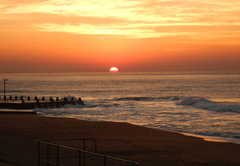 Ansteys has great lifeguard protected beaches, paddling pools for small children at both beaches, consistent good surf, warm water all year round. The beautiful unspoilt Bluff beaches are also very popular for leisurely strolls - arm yourself with a steaming hot cup of coffee in the early mornings, take a quick walk to the beach and experience the most spectacular sunrises, or grab your bathing suit, go for a hazy late afternoon swim/surf or simply just sit on the beach and watch everyone else frolic in the surf - life certainly doesn’t get much better or more relaxing than that! 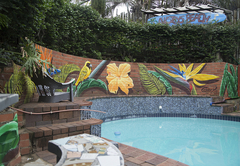 We cater for all budgets, offering a variety of comfortable, fully equipped self catering units from 2 sleeper to 8 sleeper units set in a tropical garden, as well as a backpackers hostel for those travelling on a tighter budget. 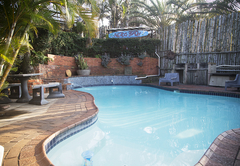 Owned and run for many years by a well-known surfing family and friendly, helpful staff, a relaxing holiday in a homely atmosphere is guaranteed. Private room with 1 Double bed and 2 Bunk Beds. Shared bathroom facilities with Aloe 2 and Aloe 3 in one house (no kitchen). Aircon, kettle, bar fridge, small TV. Room only. Linen provided but please bring own beach and bath towels. 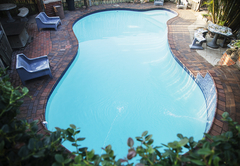 Studio style fully equipped self-catering en-suite apartment with double bed, air-con, private bathroom, kitchenette and private barbecue area. Please note: apartment is adjacent to bottom communal bathrooms so can get noisy at times. No sea view. 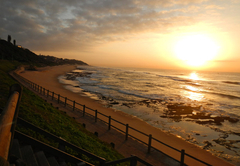 4 sleeper fully equipped self catering apartment with sea views. 1 main bedroom with double bed. 2 single beds in lounge/kitchen area with TV. Wooden deck. 1 bathroom only (shower, toilet, basin), off main bedroom. Loft Style fully equipped unit with fabulous sea views. Upstairs: small loft style bedroom with 1 x double bed and 1 single day bed, deck with great sea view - lie in bed and check out the ocean! Downstairs: bathroom, kitchen area, barbecue area. 1 bedroom apartment with queen size bed in main bedroom. 1 x single day bed, TV in main living/kitchen area. Own private patio and barbecue area with partial sea view fm bbq. 1 bathroom off main living area (shower, toilet, basin). Loft style garden unit with double bed upstairs and single bed, TV in main living/kitchen area. Fully equipped. 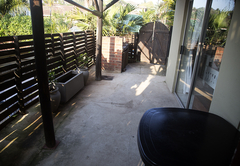 Lockable private enclosed balcony area. No sea view. Large fully equipped studio style apt with fantastic sea and beach views from front of garden. One of two flats set away from main establishment. Private and secluded. Barbecue area. Note: Beach Cove 2 can be converted to twin beds on request. Private twin superior room with 2 single beds. Shared bathroom facilities with Aloe 1 and Aloe 2 in one house. Air-con, kettle, bar fridge, small TV. Linen provided but please bring own beach towels. 4-6 sleeper fully equipped self catering apt. with sea views. Top Unit, closest flat to beach. Main bedroom: double bed, private en-suite bathroom. Main lounge kitchen area: 2 bunk beds & 2 single couch beds, en-suite bathroom. Private barbecue area. 4-6 sleeper fully equipped self catering apt with sea views. Bottom unit. Closest flat to beach. Main bedroom: double bed, private en-suite bathroom. Main lounge kitchen area: 2 bunk beds & 2 single couch beds, en-suite bathroom. Private barbecue area. Small basic room with single bed, kettle and small fridge. Not en-suite. Small private enclosed patio. Use of communal showers, toilets, kitchen and lounge. Linen provided but please bring own beach and bath towels. Basic wooden cabin family room with double bed, single bed, kettle and small fridge. Not en-suite. Use of communal showers, toilets, kitchen and lounge. Linen provided but please bring own beach and bath towels. Good, clean rooms. Friendly service. KELLY TREATED US WELL! 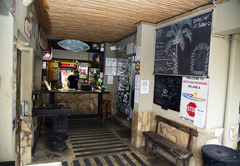 Response timeAnsteys Beach Backpackers typically responds to requests in 5-10 minutes.